The Alphabet of Melanoma, A Skin Cancer Tutorial By Gloria Vergara-Octaviano, M.D. If you draw a line through the mole, the two halves will not match. If one half is different from the other then it is asymmetrical which means it can be melanoma. A poorly defined, uneven or scalloped border maybe a sign of melanoma. Most non-cancerous moles have one color. If you notice a variety of colors or different shades of brown, tan, black it might be melanoma. It can sometimes be red, white or blue. Non-cancerous moles usually have a smaller diameter than malignant ones. Melanomas have larger diameter than the pencil erasers which is about 6 mm.Some melanomas may be smaller when detected. If the mole is different from all your other moles in the body, if there is any change in color, shape, and trait or if it evolves in some way then it can be malignant. Also watch out for itching, crusting or bleeding. Now, that you know the ABCDE of skin cancer let me share with you the prevention guidelines recommended by The Skin Cancer Foundation. Seek the shade, especially between 10 AM and 4 PM when the sun is strongest. An extra rule of thumb is the "shadow rule." If your shadow is shorter than you are, the sun's harmful ultraviolet (UV) radiation is stronger; if your shadow is longer, UV radiation is less intense.Do not burn. A person's risk for melanoma, the deadliest form of skin cancer, doubles if he or she had had five or more sunburns at any point in life. Avoid tanning and UV tanning booths. UV radiation from tanning machines is known to cause cancer in humans. Indoor UV tanners are 74 percent more likely to develop melanoma, the deadliest form of skin cancer, than those who have never tanned indoors.Cover up with clothing, including a broad-brimmed hat and UV-blocking sunglasses. Clothing can be your most effective form of sun protection, the more skin you cover, the better, so choose long sleeves and long pants whenever possible.Use a broad spectrum (UVA/UVB) sunscreen with an SPF of 15 or higher every day. For extended outdoor activity, use a water-resistant, broad spectrum (UVA/UVB) sunscreen with an SPF of 30 or higher. Apply 1 ounce (2 tablespoons) of sunscreen to your entire body 30 minutes before going outside. Reapply every two hours or immediately after swimming or excessive sweating.Keep newborns out of the sun since their skin is extremely vulnerable. Sunscreens should be used on babies over the age of six months. Children are very sensitive to ultraviolet radiation- just one severe sunburn in childhood doubles the chances of developing melanoma later in life. Examine your skin head-to-toe every month. While self-exams shouldn't replace the important annual skin exam performed by a physician, they offer the best chance of detecting the early warning signs of skin cancer (Skin Cancer Foundation, 2016). Once melanoma spreads it could lead to death so it’s best to detect it early, know the warning signs and remember the alphabet of melanoma. Adult Acne: On the Rise by Manuel Octaviano Jr.
Wash face twice a day and after sweating .Perspiration can make acne worse, so wash skin as soon as possible after sweating. Use your fingertips to apply a gentle, non-abrasive cleanser. Using washcloth, mesh sponge can irritate the skin. Scrubbing your skin can make acne worse so do not attempt to scrub your skin. Multipolar radio frequency (RF) This procedure, which is relatively new, is a non-surgical option for people who want to treat wrinkles, sagging, and other signs of aging. Multipolar Radio frequency uses electric energy to treat the skin of the face , neck and other parts of the body by heating up the superficial and deep layer of the skin thus stimulating collagen production. New collagen produced by the body will then smoothen and lift the skin. This procedure requires no incisions and has less chances of side effects. Another option for wrinkle reduction is Laser treatment. Syneron- Candela, a leading laser company,developed a technology called Elos (Electro opical synergy) that combines the power of Diode laser and bipolar RF. This combination directly heat the second layer (dermis) of the skin and stimulate the production of collagen therefore achieving youthful, firm and toned appearance without downtime. Lasers and Lights are ideal for targeting signs of ageing including sagging under eyes, saggy brow lines and nasolabial folds. A non-invasive lifting procedure that has been in the market longer is Galvanic Iontophoresis. Galvanic Iontophoresis Facial is the therapeutic introduction of soluble salts into tissue by means of electric current.It increases penetration of drugs into surface tissue without the pain of injections. This helps reduce wrinkles, buff and tone up the skin and reduce puffy eyebags. For wrinkle iontophoresis ,retinoic acid. hyaluronic acid, or vitamit C serums are pushed into the skin to fight the free radicals that causes the skin to sag or wrinkle. 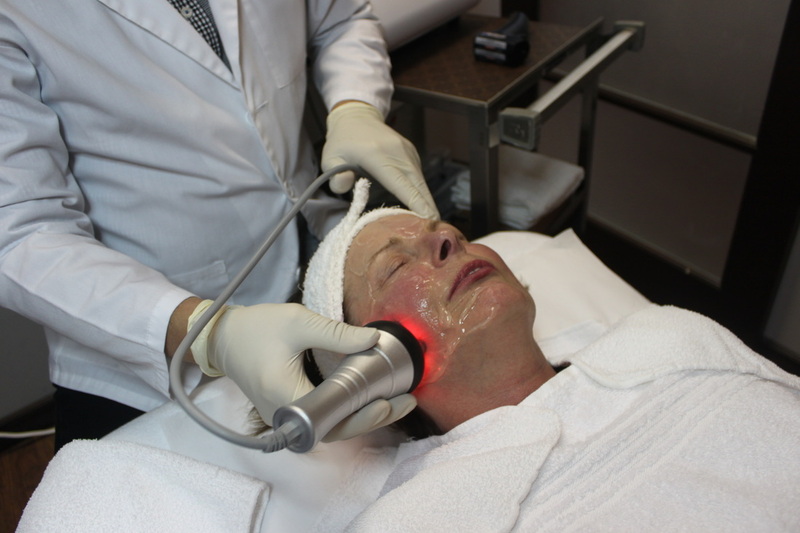 Ultrasonic Facial is another non-invasive, powerfully effective treatment that rejuvenates skin. It emits low frequency sound waves that are used to deliver products more deeply and breaks down oily deposits thus removing imperfections, softens the skin and irons out wrinkles. Prevention is always better than cure so to avoid photoageing , use a good hypoallergenic sunscreen with at least SPF 30. Sunscreen must be applied 20-30 minutes before sun exposure and must be reapplied every 2-3 hours. Avoid smoking as it has been proven to cause premature ageing. Ultraviolet exposure through the use of tanning bed is also discouraged because not only will it cause premature wrinkles it will also increase the chances of skin cancer (melanoma ) especially among young girls. MICRODERMABRASION AND BEYOND........ by Manuel Octaviano Jr.
Microdermabrasion is a non- invasive mechanical exfoliation treatment for superficial skin resurfacing. Other skin exfoliation used in today’s cosmetic market are chemical exfoliants like glycolic and tricholoacetic acid peels and laser treatments.The depth of resurfacing achieved with microdermabrasion is moderately superficial as compared to the more aggressive laser resurfacing procedures. The target depth for most microdermabrasion procedures is removal of the stratum corneum and this is achieved based on the principles of wound healing. By wounding and removing the uppermost layers of the skin in a controlled manner, cell renewal is stimulated with regeneration of a healthier epidermis and dermis. Histological evaluation of facial skin after repeated Microdermabrasion treatments demonstrate a reparative wound-healing process leading to cell regeneration and ultimately a smoother epidermis. Skin hydration increases with improved epidermal barrier function, and fibroblast stimulation increases dermal thickness through production of new collagen and elastin. Microdermabrasion is commonly used to treat sun damaged skin and is proven to improve skin texture, large pores, blackheads/whiteheads, and hyperpigmentation such as melasma and solar lentigo. It also improves fine lines and superficial acne scarring. Microdermabrasion devices use crystals or diamond tips as the abrasive element . Negative pressure draws the skin to the hand-piece tip then the crystals or diamond tips superficially abrade the skin's surface as they pass across the epidermis. Used crystals and cellular debris are aspirated and collected in a sterile container to be disposed after each treament. Each pass of the hand piece removes approximately 15 μm of skin, and two passes of most microdermabrasion devices fully removed the stratum corneum. The depth of resurfacing achieved with microdermabrasion is the same as superficial chemical peels however microdermabrasion offers minimal discomfort and has generally no downtime hence it’s usually called “lunch time peel”. Recent advances in microdermabrasion technology includes “Hydrafacial” and “Silk Peel” which combines exfoliation with dermal infusion . During this process, topical products like hyaluronic acid or salicylic acid, etc. are delivered into the skin at while doing exfoliation. These systems take advantage of the transient disruption to the epidermal barrier that occurs with removal of the stratum corneum to better deliver medications into the deeper dermal layers. Dermal infusion can enhance results for conditions such as dehydration, hyperpigmentation, acne scars, and rosacea depending on the products used. Microdermabrasion treatments are most commonly performed on the face, neck and chest. It is usually done in 6-8 treatments every 2-4 weeks. Single treatment is not enough to see results therefore follow up is normally recommended depending on the skin problem. It is usually combined with other treatments such as IPL skin rejuvenation or lasers for better results. Patients typically experience redness or superficial skin peeling after the procedure. Moisturizer as well as sunscreen protection with SPF 30 or greater is recommended after each procedure. It is best to talk to your skin care practitioner so you will be better informed about this treatment. Have you ever noticed dark brown patches on your cheeks, forehead or chin recently? Well.it could probably be melasma. So, what exactly is Melasma. Melasma sometimes called chloasma or “mask pregnancy” is a skin pigmentation more commonly seen in Asians and Hispanics. The exact cause of melasma is unknown but it could be trigerred by several factors and the most common is sun exposure. Women who are pregnant can also develop melasma that fades after pregnancy thus it is also called “mask of pregnancy”.Other risk factors are oral contraceptives (Progesterone), Hormone Replacement Therapy (HRT),cosmetics or products that makes the skin sensitive to light and hypothyroidism (low level of thyroid hormone). Uncontrolled sunlight exposure is considered the leading cause of melasma, especially in individuals with family history of melasma. Clinical studies have shown that individuals usually develop melasma in the summer months, when the sun is most intense. In the winter, the hyperpigmentation tends to be less noticeable. Melasma presents as symmetrically distributed hyperpigmented macules in areas that receive maximum sun exposure, including the cheeks, the upper lip, the chin, and the forehead, however, melasma can also be seen in other sun-exposed areas of the body. Melasma is more common in women than in men; It generally starts between the age of 20 and 40 years, but it can begin in childhood. Melasma is more common in people that tan well or have naturally brown skin (Asians and Hispanics) compared with those who have fair skin (Caucasians). Melasma is one of the skin pigmentation I find hard to treat especially if it has been present for a longer period and since it responds to treatment gradually there’s always the tendency for patients to resort to other over the counter topical creams that might cause hypersensitivity resulting to more skin damage. Each of us has different skin types so what is effective for your friend might not work for you so it is always better to seek help from experts. Melasma can improve with microdermabrasion, Intense Pulsed Light (IPL) or laser treatment, a machine that destroys the melanin pigment by means of heat and light. Topical depigmenting agent can also help like Hydroquinone, Azelaic acid and Vit. C. I find the combination of Hydroquinone, Retinoic Acid and Hydrocortisone (Kligman’s formula) more effective than other creams. Oral medications that are currently under investigation includes Tranexamic acid (also used to stop bleeding) and Glutathione but both are not recommended at this time. Melasma can improve in time but there are no overnight treatments. There is no hard and fast rule in treating melasma it is always a case to case basis. Ask your skin practitioner/dermatologist about your options. Flat Warts, Filiform Warts and Skin Tags by Manuel C. Octaviano Jr.
Flat Warts (Verruca Plana) is a common benign skin condition . They are caused by a virus known as Human Papilloma Virus (HPV) and they can be seen anywhere in the body. Flat warts can affect all ages and are common in both men and women. While common warts are more frequently seen in children and immunocompromised individual more cases of flat warts are seen in in adults especially women who just gave birth. With men, we usually noticed warts on their faces especially the bearded area. Flat warts are slightly raised, smooth, light brown pinpoint papules that are usually mistaken for moles. It often takes a few months for warts to grow large enough to be noticed. They are usually self limiting and can go away even without treatment however it tends to grow in large numbers of 20-100 pieces at a time. There are times when new warts appear as fast as old ones go away because old warts shed virus cells into the skin before it gets treated. Filiform warts, on the other hand looks like long thin fingers that stick out and grow quickly. They often grow on the eyes, around the mouth and nose. Since warts are viral in origin it can spread from person to person or by touching someone’s body or by sharing towels or personal items. Warts can return on the same site or appear in a new spot later. Another common benign skin lesion seen among Filipinos is skin tag (Acrochordon) ,these are soft, skin-colored growth that hangs from the surface of the skin attached on a thin piece of stalk. They easily move or wiggle back and forth. A skin tag is painless but can bleed and become irritated by frequent touching or rubbing. Warts and skin tags are usually treated by methods like electrocautery, cryotherapy, excision , lasers or Cantharidin paint.We don’t recommend treating flat warts or skin tags on the face with topical solutions like Salicylic acid since it destroys the surrounding normal skin hence burns and pigmentation may occur. If your warts or skin tags hurt, bleed, become bothersome or multiply fast then it is time to see your skin practitioner. You’ve probably asked this question to your aesthetician or dermatologist and I bet they gave very different answers. I have heard some aestheticians claim that dermatologist do not have enough knowledge with facials because they are only trained to treat skin diseases while dermatologists say that there are not enough scientific studies to back up claims that facials really work. If your face is too dry or too oily, or you're always looking for ways to cover up unsightly facial blemishes, a facial may help. A facial is usually defined as deep cleansing treatment applied to the face, designed to eliminate clogged pores, blackheads, and other skin imperfections. It includes several steps that can include the use of creams, masks, peels, steam, exfoliation, extraction and massage. However, there is no “ one size fit all” technique in facial treatment, everyone has a specific skin type thus it cannot be the same for all the clients. A spa facial is soothing and relaxing and is done to pamper yourself but not to treat the skin problem. On the other hand, medical facials start with skin assessment and consultation so that the skin problem can be properly addressed and treated. Proper skin assessment is important so as not to aggravate the skin condition, There are so many horror stories about “Facials gone wrong” and this is because there is no proper skin assessment or the facialist does not have enough knowledge about the client’s skin condition. For example, some skin care providers do comedone extraction because it is included in the facial package even if it is not needed. The facialist will try pricking the skin until it bleeds, it will then end up with scars which are harder to treat in the end. Additionally, too much massage may cause bruising and sometimes may lead to skin inflammation and acne breakouts. Some “organic” products are too harsh that it causes severe hypersensitivity reaction or allergies (contact dermatitis) so their skin will end up worse than before. As a dermatologist, I believe that facials can help clear your skin provided: it is customized for patient’s skin type, it is combined with other clinically proven procedures like microdermabrasion or galvanic treatment and done by a certified skin care provider. If you want to treat and pamper yourself, by all means go to a spa for facials. If you want your skin problems treated then make time to research and find a good skin care provider. Do not trust your skin to just anyone, you only have one face and you don’t want it ruined by just one facial treatment. Cellular phones and laptops have long been implicated as the cause of various health conditions but recently we have been hearing the words “tech-neck” or “smartphone face”. So what exactly is technech or smatphone face? Dermatologists and cosmetic surgeons coined these names because of the increasing number of skin tightening procedures and chin implants that they claim are secondary to cellular phones and laptops. Doctors say that frequent neck bending cause by looking at the cell phone screens will lead to sagging skin, dropping jowls and lines just above the collarbone. A pioneering medical aesthetic practitioner, Dr Mervyn Patterson, of the Woodford Medical Aesthetics coined the name “smatphone face”. He claimed that 'If you sit for hours with your head bent slightly forward, staring at your Iphone or laptop screen, you may shorten the neck muscles and increase the gravitational pull on the jowl area, leading to a drooping jaw line. We usually see sagging skin and wrinkles at the beginning of middle age but apparently there is an increasing incidence of premature skin sagging because of too much use of smartphones and laptops. Other doctors call them ‘tech-neck’ which is found mostly in people aged 18 to 39 who have an average of three digital devices and look down at their screens up to 150 times a day. The frequent neck bending hastens the impact of gravity and natural loss of the skin’s elasticity leading to folds and sagging skin. Wrinkles are natural part of ageing, it start to appear as a result of sun exposure, frequent use of facial muscles, smoking, alcohol drinking, genetics and hormonal depletion. People who suddenly lost a lot of weight may also experience sagging skin. Creams and serums containing retinol or retinoid have been proven to reduce wrinkles and fine lines. Other medications include powerful anti-oxidants like Vitamin C and E, CoenzymeQ10 and Alpha Hydroxy Acid (AHA).More invasive procedures include injectables like soft tissue fillers and Botox, skin resurfacing and surgery (ex: face lift, feather lift). Non invasive treatment options are laser skin tightening, Intense Pulsed Light (IPL), Radio Frequency, microdermabrasion ,chemical peels and microneedling. These procedures may be combined for optimum treatment but results may vary depending on the location and depth of wrinkles. Repeated treatments may be necessary so make sure you discuss this with your skin practitioner to see which treatment is best for your skin. How to prevent premature wrinkling? Wear sunscreen even on winter when outdoors, it is best to use broad spectrum sunscreen that will protect your skin from UVA and UVB with at least SPF 30. Do not expose to too much sun and wear protective clothing, wide-brimmed hats and sun glasses. Avoid smoking because it is proven to cause premature ageing. Sleep early and eat healthy. Microneedling Therapy: The Answer to Acne Scars, Wrinkles and Stretch Marks? By Manuel C. Octaviano Jr.
Post acne scarring is depressing especially if it occurs on the face. It may lead to social embarrassment and low self esteem. Treating facial scars has always been a challenge for dermatologists because of the side effects and the limitations that most of these treatments bring. Treatment procedures for post acne scars include laser skin resurfacing and dermabrasion (not microdermabrasion).These procedures are effective but with longer downtime hence it needs more time to heal. Presently, microneedling therapy also known as collagen induction therapy CIT) or Percutaneous Collagen Induction (PCI) is slowly gaining success in the treatment of post acne scars, wrinkles and stretch marks. This minimally invasive procedure uses a device that contains very fine needles that punctures the skin effectively enough to stimulate collagen and elastin production. The microchannel produced will also aid in the penetration and absorption of therapeutic serum. Micro needling system improves the skin texture , increases skin thickness. reduces pore size and stretch marks. Microneedle number and sizes may vary from 0.5 to 3.0 mm and can be manual, electric or battery powered. Needles sizes of 1.0 mm and higher are designed for deeper scars and generally used by skin practitioners. It is performed in clinic setting and is done every month depending on the recommendation of your dermatologist or skin practitioner. Topical anesthesia may be applied an hour prior to procedure but it is generally well tolerated with minimal downtime. Consultation is recommended prior to procedure so that a personalized approach to treatment can be discussed. We usually recommend 4 treatments 1 month apart depending on the depth of scar and the skin response. Indeed, microneedling has a great promise for the treatment of acne scars, wrinkles and stretch marks. It is best to talk to your skin care practitioner so you will be better informed about this treatment. Gloria Octaviano is a Physician-Dermatologist in the Philippines, she is a member of the International Society of Dermatology and a diplomate of The Philippine Academy of Clinical and Cosmetic Dermatology. Manuel Octaviano is a Physician in the Philippines, he is a Fellow of the Anti Ageing Medical Society and a member of Philippine Academy of Clinical and Cosmetic Dermatology. Manny is a Skin and laser consultant/educator.